About one o'clock today, my sister, Pam, and I headed out to a monastery to see the miniature horses that the cloistered nuns there raise. We drove to Brenham and stopped at the Chamber of Commerce because we couldn't find route 105. The volunteer there was very helpful and soon we were back on our way to the monastery. The afternoon really warmed up as we went on the self guided tour. The fee was $3.00 for seniors and we got a small map of what to see. The first stop was the horse barn where we saw several yearlings in stalls. There were also several outside in a pasture. You can get an idea of their size compared to Pam squatting down for a photo. 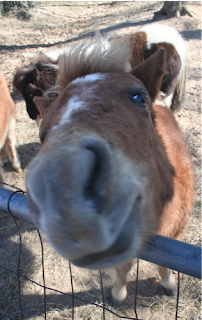 The little horses are quite friendly and come to the fence to be petted. Feeding by visitors is not allowed so no one gets bitten. 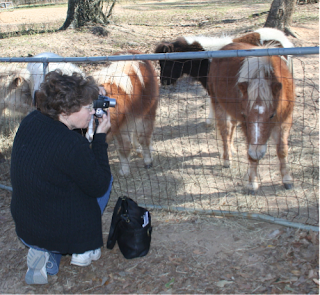 The nuns have been raising these miniature horses since 1981, and there are about 60 horses presently in the herd. These miniature horses are used for pets, in specialty horse shows, and are quite strong at pulling carts, for their size. These are all of the mares that will be ready to foal this coming spring. The foals are born during March-May. The nuns sell miniature horses and the prices range from $500 to $5000. After this visit we headed out to visit a winery that the Chamber of Commerce had told us about. It was located on a back rode and we weren't quite sure we had found the right place when we arrived. We went into a small out building and sure enough there were folks inside serving up tiny sips of wines. Little did we know that tasting a few wines would cost us as much as it did. I only had a sip of one variety, since I was driving, and Pam tasted three. She did buy a bottle of a wine she liked, but was surprised that the cost was ten dollars more than the stated price. Turns out if you taste anything, it will cost you five dollars each. It would have been nice if they told us this beforehand. We got back to the campground about 4:45. It was my turn to fix dinner and I had "red stuff" brewing in the crock pot while we were gone. It is kind of a goulash that my kids are familiar with. After dinner, we spent some time around the campfire and headed back to our rigs around 8:30. I'm not sure what we'll do tomorrow. Stanley will, of course, watch the SuperBowl. Well, the water hose didn't freeze last night, but the temps were very chilly. Emma and I watched another sunrise, but the sun didn't bring much warmth until early afternoon. We headed out around 9:00 to walk a couple of the trails and saw quite a few deer. Most of the afternoon was spent outdoors reading and walking the beach along the lake. Pam and Stan cooked burgers over the fire tonight, and after putting on my winter coat, we spent some time around the campfire just chatting. Emma spent a little time at the campfire, but I brought her back to the motorhome since she really hates the fire. I don't know why that is, but she just shakes like a leaf so she is better off inside. We didn't leave McKinney State Park until 12:30 yesterday, a very late departure time for me. I usually like to be on the road by 9:00, but the cold and icy weather made it more prudent to wait. In the meantime, we went to the local HEB grocery store and stocked up on some supplies. On the way out of the park, we also dumped the tanks since we will be at our next stop for six nights. The sun finally came out and the temperatures warmed some, so we headed out. It was a realitively short drive of only 86 miles, so we could take our time. 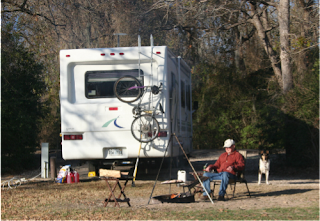 Little did we know when we arrived, that there were only about five rigs camping in the park in the more than 100 sites. We asked the gal at headquarters to recommend the best two sites and she did. We took a look at sites 44 and 45 and fell in love with them. The sites were very large, were very private, and had a magnificent view of the lake. What more could you ask for? I couldn't have put out my awning if I wanted to because of the trees, but that side of the rig gets the afternoon shade, so it wouldn't matter in warmer weather. 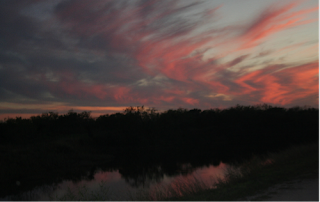 This is the view of Lake Somerville from my site. The site goes all the way down to the water and you can walk forever on the beach along the lake. This is one of the few parks in the area that isn't under a fire ban. That's the reason we came here. Last night Pam and Stan fixed chicken over the fire and today I did Italian sausage. I'm going to enjoy our stay here! Every evening, there are dozens of cardinals foraging in our backyard along with ruby crowned kinglets, white throated sparrows, blue gray gnatcatchers, Carolina wrens, tufted titmice, yellow rumped warblers, and Carolina chickadees. 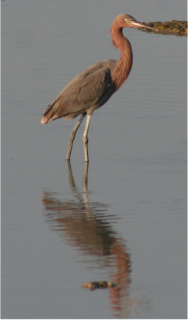 Along the shore are also spotted sandpipers, willets, coots, and plenty of crows. If the temps were about ten degrees warmer, it would be perfect. I didn't hook up the water yesterday because the forecast was for freezing temps last night. When Emma and I went out this morning at 6:30, there was definitely "frost on the pumpkins." It was a good decision. Today I hooked the hose up and we'll see if that was a good idea. It does seem a tad bit warmer this evening. This afternoon, Pam and I drove to town to find where I can fill up on propane on the way out. We stopped at a lumber store that was more of a hardware store and picked up some firewood and verified that it will be a good spot to fill the propane tank. We visited a few other stores in the town of Somerville, filled up the car with gas, and headed back to camp. This park is really out in the boonies. This is Stan with their collie, George, enjoying the sun and campfire. That's where we do our cooking. Emma and I went out at 6:30 this morning for her first walk and I wore shirt sleeves. It was in the sixties. That was the lull before the storm. I watched the news before Pam and I left on our sight seeing expedition, and packed my sweatshirt and windbreaker just in case. Boy am I glad I did. By the time we made it to the LBJ Ranch, it was raining and the temp had dropped into the thirties! That didn't stop us from having an enjoyable time, though. We went to both of the National and State Parks, watched two informative movies on LBJ, went on two guided tours, did one auto tour with a CD, and about froze our tutu's off on the mostly outside tour of the Texas White House. By the time we returned, we were starving, as there wasn't anyplace to eat around lunchtime. Stanley had said he would take us out for dinner tonight, so we walked the dogs and got ready to go to the Texas Steak and Cattle Co. for dinner. I checked the weather forecast before we left and decided to fill the water tank and detach the water hose and store it. The temperature has a very good chance of going below freezing tonight and we may be hit by an ice storm. I don't want my pipes to freeze and the hose was still pliable tonight. By morning, it would have been very difficult to roll up, to say the least. The DISH had also lost it's satellite connection, but I didn't have time before we left to check on that. The food was delicious and if we hadn't have gotten lost on the way back, we would have been home before dark. After about a half hour, I was able to site the DISH on the satellites again so I'll have TV for the evening. We are scheduled to leave here tomorrow to move on to Lake Summerville State Park, but I'm positive it won't happen very early. We'll have to check on road conditions before we depart. I forgot to bring my Harley! 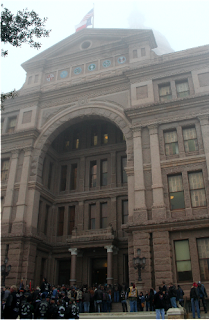 Pam, Stan, and I headed out in the very dense fog this morning to visit the Capitol Building in Austin. As we neared the entrance we noticed a big crowd and what appeared to be a protest group being taped by TV cameras. 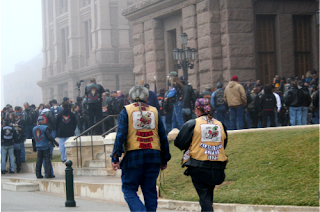 Sure enough, many biker groups from Texas had gathered in their yearly visit to their senators and representatives. They were most interested in protesting their opinion of the law that allows a vehicle driver to run a red light and injure or kill a biker and then only receive a $125 fine. I wanted to take the guided tour of the building, and we did so. The tour guide was quite adversely effected by the large contingent of leather-clad visitors and was disturbed by the noise they created. He shouldn't have been, in my opinion, as the capitol belongs to the people of the state and they have every right to be there. I, for one, enjoyed the tour and all the history the guide imparted to us. Texan's have a heritage to be proud of. 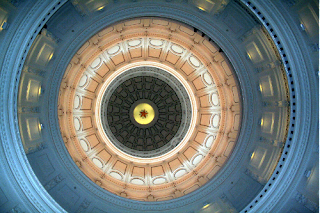 This picture is looking up in the rotunda. It was more spectacular than this shows. You can still see the heavy fog even though it was noon. Pam and Stan are those tiny figures in the fore ground. After the tour, we headed back to the car in the capitol visitor's parking garage and got prepared for the downtown parking fee. I couldn't believe it when the attendant said our fee for over two and a half hours was 75 cents! This must be among the biggest bargains in America. What a pleasantly surprising shock that was. Pam revved up her GPS and in no time we were at Stubb's BBQ in downtown Austin. This place had been recommended to me by the lady at the state park reservation office, and it was a winner. Stan and I enjoyed the pulled pork sandwiches and Pam had the brisket sandwich. You have to order in the bar, and by the time you sit down, your order is served. This was an excellent example of Texas BBQ. 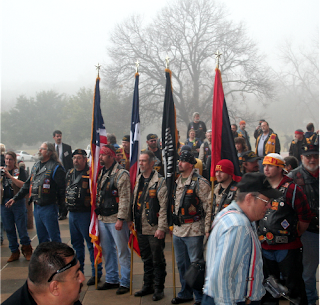 About an hour after we returned to McKinney Falls, the fog finally started to lift and the temperature got up to 70. I took Emma out for a good walk and we chased up five deer. 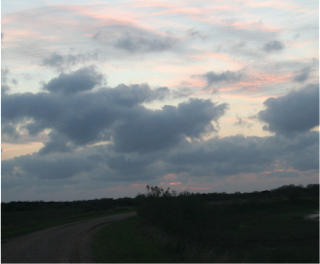 There is a winter storm approaching, and I hope it won't damper our plans to visit the LBJ Ranch tomorrow morning. I accidentally uploaded a repeat sunset from Choke Canyon tonight and don't know how to delete it. That's it for today. At 6:00 in the morning on Saturday, the cold front began to move through. The winds were strong enough to wake me up with the rocking of the motorhome. Not a good day for birdwatching...I spent most of the day on the computer with a few breaks for power walks around the campground to expend Emma's energy and get my cardio in for the day. A group of five Airstream campers came in in the afternoon and I was surrounded. They were going to stay for several days and were interested in my site since there were no trees covering my rig. One of the rigs couldn't get satellite coverage because of the tree canopy over their rig at their site. I let them know that I would be pulling out in the morning. As I hooked up the toad and headed out shortly after nine, the Airstream motorhome had it's motor running and was ready to move to my site. I waved as I went by and headed for the dump station. After one missed turn and 161.5 miles, I settled in at McKinney Falls State Park in Austin, TX. I gave my sister a call and she and Stanley arrived about two hours later. They are in the site next to me. We made plans this evening to take a trip into Austin to visit the Capitol Building and other sites in town for tomorrow. They have two dogs, so Emma was introduced to George and Mitsy. Emma was her usual exuberant self, much to the chagrin of the more sedate and older canines. I'm looking forward to the next nine days touring with someone besides myself. My sister, Pam, called me last night to let me know they didn't want to spend nine nights at McKinney Falls State Park because they still had a fire ban on. We all enjoy a campfire in the evening, but there hasn't been any rain in the area since October, hence the ban. I said I wanted to spend a few days at McKinney so we could tour Austin. This morning I called Texas State Parks and Wildlife and talked to a very helpful person. She suggested things to do and places to eat in Austin and found another state park within 100 miles that didn't have a fire ban. 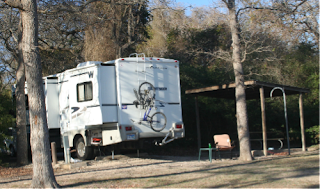 So, we'll spend three nights at McKinney Falls, and then move on to Summerville Lake State Park for the remaining six nights. The temps today got up to 80 degrees, and I enjoyed just relaxing and watching the birds. I also spent considerable time getting the sand burrs out of Emma's feet. They are everywhere that isn't paved and painfull. A weak cold front is supposed to pass through the area tonight, so it will only be in the high sixties tomorrow. I'll see if I can find the rare Mexican Pine Flycatcher that has been seen in the park. This has been a restful day. I tried a different route out of the RGV today, and it saved me about twenty miles to get to Choke Canyon State Park. I ended up leaving at 10:15, and after 212 miles, pulled into the park at 3:15. A picnic area appeared along the road right at noon, so I took advantage of that fact and stopped for lunch. Even though I had a reservation, there were only about five sites to choose from this afternoon. 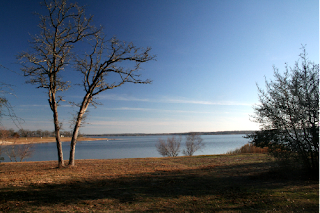 State Parks in Texas are popular places for Winter Texans. What a great site I ended up with! The Choke Canyon Reservoir is right behind my site and the sites are very roomy. My nearest neighbor is probably about 100 yards away. Each site has a covered picnic table with sturdy supports to put Emma's tie out cable on. I was sweating bullets as I set up and had my usual frustrations with finding the satellites for the DISH, but I don't give up easily. There are ducks on the lake that I'll take a closer look at tomorrow and I will investigate some of the trails. I'll be here until Sunday and the forecast appears to be very nice. It was windy today, but for a change I had a strong tail wind that made the journey a lot easier. The sunset from my site wasn't too shabby either. "Oh my goodness, my human was on a mission this morning! She gets a little bent on moving days and I needed to stay out of the way while she got things ready to go. I didn't know what was going on until she moved my crate in front of the kitchen sink. That's a sure sign that things are going to change. What are all the javalinas, coyotes, rabbits, and turkeys going to do without me there to check up on them? I don't know why we have to move, I was happy there. Oh well, at this place I checked things out very daintily at first. I guess I'll get used to it. At least there were four deer right behind the motorhome just before we went in for the evening. That got my blood running! Now, if I could just figure out how to bite through this steel cable........."
I led my last bird tour this morning and we had a full van, including my ex-husband. All went well and we saw a nice variety of birds. After lunch, I handed in my keys and clicker and turned in my hours for the month. I've been here three months, and it's time to move on. Tomorrow, all I have to do is detach the water and electric, put away the satellite DISH, and hook up the car. I'll be checking the pressure of the tires on the way out at the maintenance shop and then hit the road. The forecast is for a high around 80 tomorrow, but with strong winds in the afternoon. I'll try to be on the road between nine and ten and have about 200 miles to go to get to Choke Canyon State Park. When the winds kick in, at least they'll be from the south and I'm headed north so it may help with the gas mileage a little. I was a busy bee all afternoon getting things ready to go. I think I've remembered everything, but we'll see tomorrow. I put aside chores to get ready to leave in order to watch the Presidential Inauguration this morning. What a time to live in history! Whether or not you voted for Borrack Obama (I'm not sure I spelled his name correctly), it was an historic occurrence. I had to watch. It was a stirring experience, to say the least, when you consider the last forty years. I am proud to be a citizen of the United States of America. I did call Elliff Motors this morning, and the work on the new Focus was done. I waited until after the Washington ceremonies to pick up the car. Then I spent most of the afternoon doing grocery shopping, getting a supply of rawhide in for Emma, and going to Baker's Acres for oranges and grapefruit to share with my sister next week. When I got back, I joined a bunch of the other volunteers for some social time since it was a gorgeous late afternoon and we were able to sit outside in the warm temperatures without any mosquitoes. I had to leave the impromptu gathering to try to get reservations at Choke Canyon State Park for three nights when I leave on Thursday. While I often don't make reservations, it seems necessary at this time of year in Texas. Eventually, I was successful with that venture, so I'll head out on Thursday for about a two hundred mile drive to the park. I stopped there for one night in '07 on my way down to the valley, but since it was only an overnight stay, I didn't get to explore the park much. My last bird tour is tomorrow and then I will be done with my work stint here. I am ready to move on. If you have read my last post, you know that Crystal left this morning with my old car. What you don't know is that my oldest son, Daniel, called me a few weeks ago and asked if I still had the engagement ring that I had told him he could have when the time came. The diamond in the ring is from my grandmother's engagement ring (his great-grandmother) and I had it reset for my engagement ring. The stone (in a ring) is more than one hundred years old. The stone itself is, of course, millions of years old. She said yes, and it does a mother's heart good to have all of her children find love in this world with a very special person. Good for you, Daniel and Crystal! I once again bid you goodnight...........what a happy day! Yesterday, Crystal began her long circuitous route to Harlingen from Denver. She left before dawn and had plane changes in Phoenix and Houston. Finally, at 4:30, she landed. Originally, she was going to just take the car and head on back, but after the long day she decided to spend the night and leave for Denver this morning. That was probably a much safer decision. We stopped at the I Love You Buffet for dinner and then spent an enjoyable evening catching up and sipping wine. We were up by 6:30 this morning and Crystal was on the road by 8:00. After she left, Emma calmed down and I tried to call to make reservations at Choke Canyon State Park for Thursday night. I had forgotten that today is a holiday, so their office was closed. I spent the rest of the morning waiting for a call from the shop that is working on the new Focus. By the afternoon, I decided to start the outside process of packing up. I sorted through the oranges, packed up the BBQ grill and started reorganizing one of the basement storage areas. Last month I had purchased a new outside rocking chair. That meant that one of my other chairs had to go. Living in a motorhome means you have to be very aware of weight and if I get something new, something old has to go to keep the weight under the maximum that is safe for the axles. The chair that I am eliminating has been in my possession for over twenty years, so I don't feel too bad about that. I will be calling Elliff Motors first thing in the morning to see what the holdup is. They've had the car since Friday and I only have a couple of days until I leave. My health has been fine, but my computer was getting sicker by the moment. It was doing very strange things and becoming very frustrating to me. I was at my wit's end when a friend suggested I go see the "Geek Squad." I'm old enough and isolated enough not to know where to find a geek squad (at least I know what a geek squad is :)), so she told me to go to Best Buy. I did, and 24 hours and $250 dollars later the laptop is well and I'm protected against viruses. I had tried to install some spyware about two weeks ago, but was unsuccessful. I know where the virus came from and I'm not happy. The Fish and Wildlife Service, and other government agencies, have instituted new rules lately about volunteers using government computers...they are not allowed to touch them! Of course, we're still asked to do things that require using a computer and are asked to use our own. The problem arose when something was downloaded on the computer in the Outpost that was infected. The virus spread to several of the volunteer's computers and because of my difficulties installing some protection, my computer was crashing. I don't think I'll do anymore government work on my laptop. There's more to this story, but I won't go into it here. In the meantime, I got a call from Elliff Motors that the base plate to be installed on the new Focus had arrived, and I drove the new car to Harlingen on Friday and switched out with the old car. So the new car is now in the shop getting the plate and having the brake system installed and won't be ready until Monday. Tomorrow, I will be picking up Crystal at the airport and she will drive off with the red Focus and I will be car-less. All of this with only a few days left before my planned departure. Thank goodness, I have the next few days off to get things organized and packed after three months here. 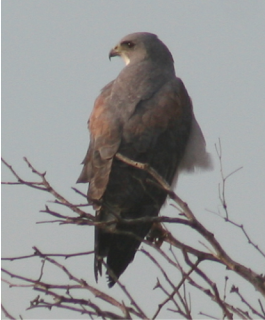 This morning's bird tour was a success and we even found a Peregrine Falcon during our trip. The fore casted rain never materialized as the front got stalled north of here, and we had a sunny, warm day. It's supposed to be very nice for the next six days. That would be great. I've tried to download a picture, but I'm not having any better luck than before, so that seems to tell me that it is an Internet connection issue rather than the virus thing. I will definitely use my trucker's antennae and booster at my next stop to see if that helps. This morning's waterfowl count was my last for the year; not because the birds are leaving, but because I will be migrating a little north in a week. 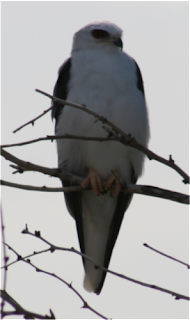 Even though I have been censusing the same route for the last month or so, the birds do change weekly. For instance, I counted over 700 sandhill cranes last week, but could only find 21 today. As usual, coots where at the top of the list with 10,001 individuals counted. There were also nice numbers of pintails, ruddy ducks, blue-winged teals, wigeons, and Northern shovelers. That's the trouble with birds, they have wings, and you never know what you'll see. The count took six hours today, and I will miss my time each week out with these wild wings. After a late lunch, I headed for the office to hand in my count sheet and materials and checked the visitor's center to see how many people had signed up for Saturday's bird tour. We have another full van scheduled, but I think I will be calling the folks with reservations tomorrow to let them know that we probably won't be doing any of the back roads. The forecast for the next two days is for showers and by now you know what that does to the unpaved roads around here. Maybe the weather person will be wrong again and things will remain dry. I haven't heard from the shop where the old Focus is yet, so apparently the base plate hasn't come in. I hope it gets here soon. I'm not sure what I'll be working on tomorrow, it all depends on the weather. Yesterday afternoon, Diana helped me get the old Focus into Harlingen to have the US Gear brake system removed so it can be re-installed on the new Focus. This is the braking system I have installed in the motorhome so that when I step on the brakes going down the road, it also puts on the brakes in the towed vehicle (toad) to aid in slowing down the whole unit. It takes a much greater distance to stop a motorhome with a toad than it does an ordinary vehicle. Diana's husband, John, was also leaving to take their daughter, Aja, back to Houston and to attend some doctor's appointments that he has there. We were a three car caravan heading down route 106. The county had attempted to level this miserable road on Saturday, so it was a little easier going than normal. We decided to drop off the red Focus and then meet for lunch before John and Aja took off. We had a delicious late lunch at a super Chinese buffet that also included a Mongolian stir fry...all this for the princely sum of $6.23 (for seniors ;) ). I do like Chinese. When we got back, we checked and found out that we had a full van load for today's bird tour. It turned out that half of the people on the tour had been on one of our tours last year. Two of the gentlemen were with us last year when we got stuck in the mud/gumbo and had to be towed out. The roads were very dry today so there was no danger of that reoccurring. We did have one stand of water to blast through, though. The result of which meant we had to clean the van this afternoon. In addition to birds, we saw a bobcat, coyote, and several nilgai today. It was a good tour even though it ran a half hour over our allotted four hours. Last May 18th (this date is important), I camped at Copper Breaks State Park in Texas on my way to my volunteer assignment at Dinosaur National Monument in Utah. I have enjoyed the different Texas State Parks that I've camped in, so I decided to buy a Texas State Parks Pass while I was there. The pass costs $60.00, is good for one year, and eliminates the daily use fee (which is in addition to the camping fee) for pass holders. I received a temporary pass which was good for a month and was told I would receive the official pass in the mail in about a month. Fast forward to the end of August; I still had not received the pass, so I called the Texas State Parks and Wildlife office and told them I had not yet received the pass and that I was planning on camping in several state parks on my way down to Laguna Atascosa. They said they would send it out immediately. They said they did have a record of me buying it, but sent it to an address I didn't recognize. Fast forward again to late October. (I didn't stay at any Texas state parks on the way down). I still had not received the pass. I called again, and again they said they would send it out, but that it would take about a month. Well, I received my last batch of mail on January 8th, and guess what? Still no park pass. At the rate this was going, it would expire before I ever got it! Do you remember me saying that I will be meeting my sister, Pam, and brother-in-law, Stan, at McKinney Falls STATE PARK in Austin, TEXAS, for nine nights of camping in about thirteen days? If I had the pass, it would save me $36.00 in daily use fees. Not to mention that I had planned to stay at Choke Canyon STATE PARK on the way there for a few nights. So, today I decided to call Alternative Resources, my mail service in South Dakota, to put my mail on hold until I arrive at Balcones Canyonlands NWR. I asked if they could check my mail to see if there was an envelope from Texas State Parks and Wildlife in my box. Luckily, I was sitting down when the person came back to the phone, because she told me that "Yes, you have an envelope from them." Holy Mackerel!!! After only eight months, I think I'm finally going to get my state parks pass. It would be nice if it didn't expire in May, but I'm not holding my breathe on that. Anyway, I told Alternative Resources to send my present mail tomorrow and then put any new mail on hold. That news was almost more excitement than I can stand in a day. ;) It's a good thing the rest of the day was spent on more mundane chores likes grocery shopping, training sessions with Emma the Wild Child, and restocking the orange halves I put out for the birds. I also went for a hike on Mesquite Trail and was able to walk Emma on the back roads since the hunts are over for the year. No danger of getting shot or dodging arrows anymore. I generally don't watch football on TV, but it's been a slow afternoon so I turned on the tube. My oldest son, Dan, is a dyed in the wool Steeler's fan and they happened to be starting a game. In the first few minutes, two scores were made so I decided maybe it would be interesting enough to listen to. Of course, I continued to do some surfing on the web, vacuumed the motor home, and took Emma out for another lesson. We are starting the down command today and she is not thrilled. It has been windy and unseasonably cold today. The first half of our daily constitutional was aided by a stiff tailwind out of the north. Of course that meant that the walk back was against the biting wind and I had to use one hand to hold my hood closed. My brother sent me an email that said Chicago got ten inches of snow yesterday, so I guess I can't complain. After the walk, I was the first one into the laundry room for the day. By the time I got my clothes into the driers, there was a Que of four people trying to do their wash. I don't think I'll have such a challenge getting my laundry done at my next two assignments as there won't be as many volunteers. That's a mixed blessing...easy to get the laundry done, but not as many great people to interact with. I didn't have to work yesterday, so I planned to just relax. In the early afternoon, I got a call from Boggus Ford that my new plates from South Dakota were in, so I drove into Harlingen to pick them up. I wanted to touch base with them about a problem with the driver's door window molding, and got that fixed while I picked up the plates. It was a pretty peacefull day. We had a full van load signed up for this morning's bird tour. I woke to temps in the sixties and quite a bit of fog. We hosed off the van so we could see out of the windows and headed for the visitor's center to pick up our passengers. The trip today would be limited to the bay side loop since the last archery hunt was still in progress. The winds were calm so the mosquitoes were out in mass just waiting to prey upon us. I got several bites just taking Emma out for her pre-dawn walk. A cold front was supposed to arrive some time during the day, but it was hot and muggy for the tour. We had folks from the Northeast today with couples from Quebec, Nova Scotia, and Maine. It was a good birding morning, and we had a nice variety of species. After lunch, I headed out for Baker's Acres to get some reject oranges for the birds at the visitor's center and to get oranges for myself. Sorry to say, due to hurricane Dolly, the navel orange season is over at this orchard, so I bought some Mars oranges for my daily juice fix. They have quite a few seeds, but are very sweet. As I drove back to the refuge, the cold front from the north arrived with high winds, rain, and an immediate 20 degree drop in temperature. Temps will be into the forties tonight, so it's time to turn on my two small electric heaters for the night. I recall growing up in Chicago and building a kite with sticks, string wrapped around a twig, a knotted piece of cloth for the tail, and thin paper over the frame for the grand price of ten cents. I would take it to the school yard and run like the wind trying to get it to take off. The school yard was the only place where there were no trees. You had to look out for the surrounding electrical and phone wires, but you did have a vacant piece of sky to work with. Fifty plus years later, flying a kite has changed a lot. Fellow Escapees, Sue and Vern, met us (Diana, John, their daughter, Aja, and me) on the bay side beach of South Padre Island for a morning of kite flying. Vern is a great teacher about kite flying. There are now four lines from the kite to your hands and the kites are quite a different shape. In my youth, I was thrilled just to get the kite into the air, but now kite fliers do acrobatics and intricate moves. After Vern's tutelage, I was able to really enjoy the possibilities of flying a kite. It was like soaring with the eagles...what fun. Sorry to say, the wind soon abated, but it was sure nice being on the beach with temps getting into the eighties. All too soon, Diana and I had to return to the refuge to man the hunter check station. I enjoy working the check station, as I think I have said before. Today's take was three does, two hogs, and one five point buck. There are two hundred permits issued for this four day hunt, and about 120 bow hunters were out today. Tomorrow's temps are forecast for the eighties before another front moves through for the weekend. Bow hunters just enjoy being out on the refuge whether or not they bring down anything. They are a positive bunch to chat with as they check out each evening. I have tomorrow off since I did the waterfowl count on Tuesday, so I'm thinking of going to Baker's Acres as my orange supply is nearly exhausted. p.s. The dead ocelot that was reported earlier in the week turned out to be a dead large house cat. I guess that is a good thing...for the ocelots at least. Preparing for the last archery hunt, etc. After lunch, Diana and I prepped the Outpost for the last archery hunt that begins tomorrow. We rearranged the room and furniture and restocked the snack supplies that we sell. There were also the hunt record books to track down and set up for use. The two of us are working the check station tomorrow afternoon and evening so we wanted everything ready to go. After today's bird tour, I know there are still plenty of deer out there and more than enough Nilgai and feral hogs to be eliminated. After that was done, Diana headed off to the Harlingen airport to pick up her daughter who is flying down from Houston for a short visit. I decided it was a perfect afternoon to give the new dog training exercises a try. Today's lessons went a little better than the other day, and Emma is making progress walking on a loose leash. I also was able to subject her to some minor distractions along the walk and her behavior was much improved. I will follow the rules and no longer use one of those retractable leashes that pulls out fifteen feet. I've decided this should be called the three Ps method...perseverance, patience, and praise. Wish me luck! My plans for tomorrow include kite flying on South Padre Island beaches and then work at the check station. I set the alarm for six this morning and woke up to a heavy mist/light rain and chilly temperatures. I thought it might cancel the waterfowl count once again, but my intrepid driver, John, ignored the inclement weather and we were able to complete the route. It has been at least three weeks since the roads have been drivable for the count. The best part was seeing almost seven hundred sandhill cranes. I really love their calls. The rain seemed to keep many of the birds down for the morning so we could count them. White pelicans are not a species that we count, but they seem to arrive at each stretch of water as we approach. They remind me of B-52 bombers as they come gliding in to land. After five hours, we finished the route and headed back to camp. In the afternoon, I returned the power-point projector, that I forgot about yesterday, to the office and turned in my tally sheet for this morning's count. I also stopped by the visitor's center and found out that we have a full van for tomorrow's bird tour. I'm happy that after being on the back roads today, we will not be restricted to the Bay side loop tomorrow. Fast forward to six this evening and our weekly pot luck. As usual, the food was good and I think the two meatloaves I made turned out well. Peas have always been my least favorite vegetable and I usually avoid them. Tonight, I was pleasantly surprised to enjoy a pea salad. Maybe it's because the peas were still partially frozen. I'll be up at six again tomorrow to get ready for the tour, so I'd better think about calling it a night. One of the things I forgot to do today was return the power point projector to the office, and of course Leo, the biologist, needed it tonight. 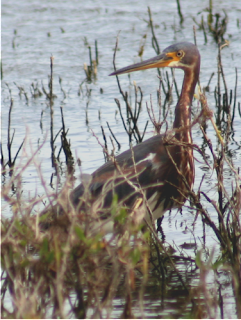 By the time I found out about his need, he was already on his way off of the refuge to the meeting where he will make a presentation. Oh well, he wasn't angry so I guess he had another source for a projector. While talking to him, he asked if I could do the waterfowl count for this week tomorrow morning. He was reluctant to ask me to do it on my day off, but I assured him that a morning spent birding wasn't exactly a great sacrifice for me. I'll just take an afternoon off later in the week. 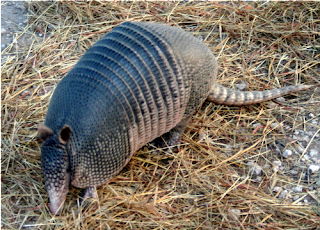 Here's another of the critters that are found on the refuge...the nine banded armadillo. You can count them; there are nine bands. Did you know that if an armadillo has to cross a river he has two options? He/she can either submerge and walk along the bottom to get to the other side, or, if it is a wide expanse, it inflates it's innards with air and floats across. While I was doing my grocery shopping this afternoon, I picked up the needed supplies for the meatloaf I'll be making for tomorrow's potluck and some really delicious cherries. What a great snack those cherries are, and healthy too. 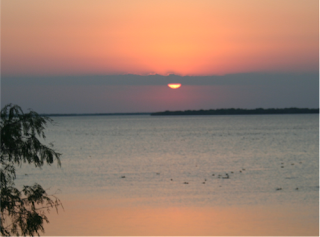 Here's another view of the refuge...sunset on Laguna Atascosa (muddy lake). I generally like to do my laundry on Sunday. I work on Saturday, and Sunday is the first of my three days off, so I like to get all the domestic chores out of the way. Besides the wash, I also started up the motorhome to keep the battery charged, ran the generator for its once a month workout, and did a major vacuuming job. I can't understand why Emma isn't bald considering all the hair that she sheds! I also restocked the orange halves that I put out for the birds and transferred everything from the old car to the new. Along about 4:30, I packed Emma and my camera into the new car and headed out for Bayside drive. I like to do the 15 mile loop late in the afternoon when the sun is behind me. 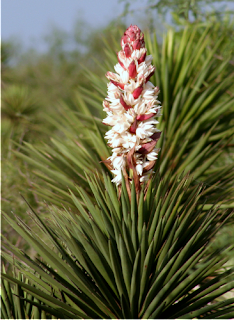 The Yuccas are beginning to bloom. Their peak blooming period is in February, but I won't be here then. The winds were calm, so it provided a great reflection. I'll be leaving here in a little under three weeks. I know I'll miss all the bird life. It has been in the eighties for the last few days, but right now at 11:30, the winds have kicked up from the north. A front is approaching and we may be getting some more rain. I leave you with a sunset shot from two nights ago. Thanks for stopping by....talk to you later, Judy....I'm experiencing the recurrent problem of no spaces between paragraphs. Don't know how to fix that. Yesterday we did another presentation at an RV park in Donna, TX. We had to leave here by 7:00 in order to get there in time to set up and present at 9:00. All went well and we were asked to return again in February. Of course, both Diana and myself will be gone by then, so we'll pass it on to one of the next sets of volunteers. Janie and Bob moved on to their next assignment yesterday and by today, we had two new couples join us on the refuge. It's sad to see good people move on, but we know we'll probably see them again sometime down the road. We have had a really good group of volunteers here this fall and early winter. Everyone got along well and made the time very enjoyable. That doesn't always happen. 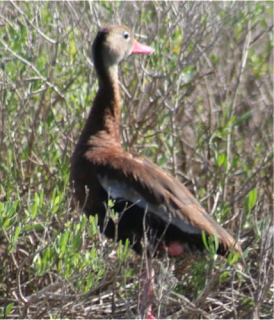 Anyway, after the presentation, we decided to visit Santa Ana National Wildlife Refuge since it was in the vicinity. I had visited there last year, but Diana had not. We walked one of the trails and scoped out the visitor's center. Santa Ana gets a lot more visitors than Laguna, mainly due to their mid valley location (in my opinion). Laguna has more birds and mammals and is 50 times the size, but is more remote and difficult to get to. 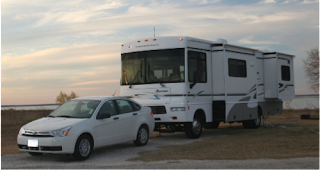 We also took a look at the volunteer RV sites for future reference. Leaving there, we stopped at Willie's BBQ for lunch in Alamo. Not sure I'd ever return there since my chicken taco had bones in it. Yuck!! We also stopped in Harlingen on the way back to try to set up an appointment to get the Blue Ox base plate installed and have the braking system switched from the old car to the new car. I wasn't entirely successful with that venture and will have to call them again on Monday. Once back to the refuge, we put the van away and after giving Emma some exercise, I made a homemade personal size pizza for dinner. The rest of the evening was spent watching TV and catching up on some blogs that I follow. We had a bird tour this morning, but weren't able to use the back roads because of the torrential downpour that we had on New Year's Eve. It takes at least a week for the back roads to become usable after a good rain. We had a very pleasant couple from Indiana on the tour and spent an enjoyable four hours on the paved roads in the refuge. This afternoon, I went to the visitor's center to turn in my December work hours and spent some time helping out Andy and Brenda since it was a day that was very busy for them. Then we got a phone call from someone reporting a dead ocelot. Since there were no "brown shirts" working today, Brenda had to call dispatch which is located at Santa Ana refuge. After a little hassle from them, I ended up going to the house of the refuge biologist that works with the ocelots to let her know about the report. All reports of dead ocelots are immediately investigated to get the body and determine cause of death and whether or not it is one of the refuge ocelots. I'll have to find out next week what became of the investigation. I'm thinking we should have another potluck this week before the last archery hunt begins on Thursday. I'd better get an announcement and list up in the Outpost tonight so folks have a chance to sign up.